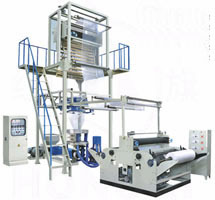 Film blowing machine,Flexible printing machine,Bag making machine,Self-adhesive Lable Printing,Packing machine series,Recycling machine,PP bags production lines-Heilongjiang Xinyuanda International Trade Co., Ltd.
Our company is a professional machine manufacturer in China. We mainly response to supply the plastic machine, printing machine and packaging machine to the domestic and abroad market. Since established, our company has adhered the concept of “ quality is first, pay attention to technological content of products, persuit excellence” and pays special attention to internal management and after-sale service. Our products are in great demand in domestic markets and well sold in dozens of countries and areas such as Southeast Asian, Middle East, Middle Asian, Russia, Europe, South America and Africa and so on. Only by relying on the success of customers, we can get development. Xinyuanda plastic machine whole heartedly welcome clients from home and abroad to cooperate with us and create success together.